(Austin) – Today Representative David Simpson (R-Longview) issued the following statement on the public conversation surrounding the Speaker race. “One week into my race for Speaker of the House, I find some advocates in the race an apt example of the problem that prompted me to run. Certain individuals on both sides are using inflammatory rhetoric and intimidation tactics to try to force members to vote for a particular candidate. “My candidacy is not about policy or the degree or quality of conservatism. It is about maintaining principle as the standard by which we govern. Those who personally attack members or threaten to attack members over their choice for Speaker are engaging in the exact type of intimidation and retribution that my candidacy is fighting against. Those who do so may not understand my purpose or frankly our system of ‘free government’ espoused by the Texas Constitution. “If a Speaker is elected on the sole basis of a political platform, then the ability for the Speaker to resist letting the ends justify a political means becomes very difficult. This pressure invites corruption and erosion of the rules. And that corruption undermines the thorough and open deliberations that are the hallmark of a successful republic. 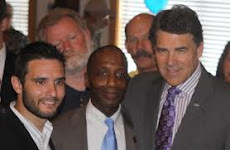 “Though we disagree on some important issues, in this race I am not challenging Speaker Straus’ conservatism. I do, however, challenge his approach to fair administration of the rules and the culture of intimidation and retribution that has developed under his leadership. For example, I do not fault Speaker Straus for personally disagreeing with the Anti-Groping TSA bill. I do however fault him for refusing to follow the rules. Instead of bringing the business of the house before the members, he abruptly adjourned and immediately told the media that there was no quorum present despite having called the House to order and having declared a quorum present. “The Speaker is chosen by members of the House to administer the House Rules and the business of the chamber. I believe the choice of Speaker is primarily about earning the trust of and having respect for the members. It is about honoring the process. I believe the Speaker should lead by example, respect principles, and honor the rules. The race should hinge on fairness in administration and not who may amass the most power for their own position. Representative Simpson lives in Longview with his wife of 27 years, Susan, and their children. Simpson, a seventh-generation Texan, runs a family business and previously served as the mayor of Avinger for several years. Hmmm Representative Simpson seems to define his purpose by being on all sides? Whats the difference in degree of conservatism and maintaining principle? He stated....“My candidacy is not about policy or the degree or quality of conservatism. It is about maintaining principle as the standard by which we govern. SO - degree of conservatism does not really matter - in moving Bills forward - it's only about the "existing" rules ONLY??? ?